After a week away because of an ear infection, we’re back on our trek around the world discovering recipes and stories. This time we’re going to Egypt, as Miss I has been asking to find a recipe from her favorite culture so far: The Ancient Egyptians. Ever since she was about 4, she’s just been fascinated by all things Egyptian. After a quick search, we came across a recipe for Tiger Nut Sweets, which is one of the oldest recipes ever recorded, found on a broken piece of Egyptian pottery dated from about 1,600 BC. We browsed several recipes, but we ended up using the one posted by Ancient Egypt Online. We used pecans instead of Tiger Nuts, which are not a nut but a starchy tuber that is used to cook in the Mediterranean cuisine. In Spain they even use them to make horchata, and they call it horchata de chufa. The recipe also suggest to get Acacia honey, but we could only find the regular clover one. The girls did the sweets all on their own, so it’s a very easy, healthy (and also vegetarian!) dish to make with the kids. I would like to experiment further with this recipe, maybe try it with walnuts instead of pecans, or see what it would taste like with tiger nuts, fig paste, or raisin paste, instead of dates. We had made in the past Indian Ladoos, which are similar to these, and the girls now want to make Brazilian Brigadeiros in a couple of weeks (we’ll be making something Irish next week). 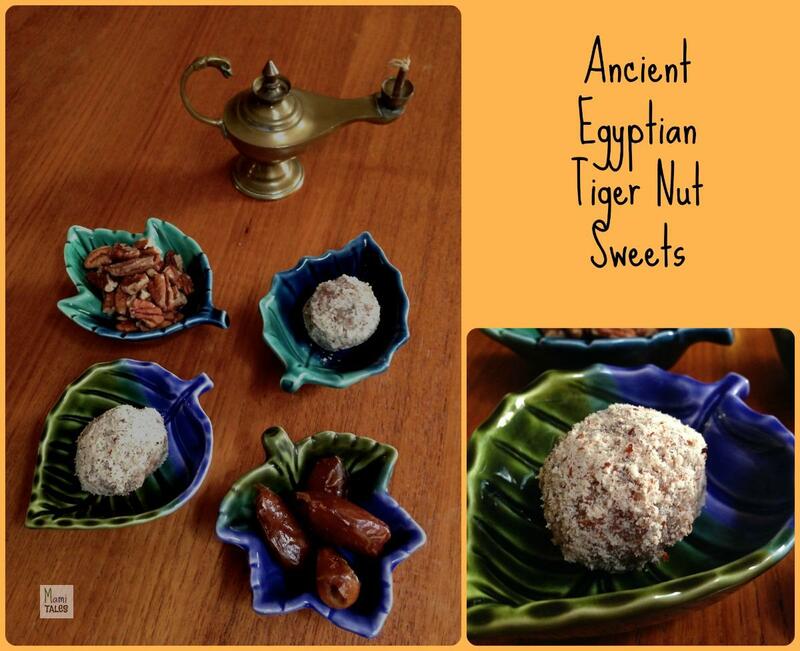 A healthy dessert that comes from Ancient Egypt, made with a date and nut paste covered in honey and almond meal. In a food processor, ground the dates until they make a very sticky paste. Place the honey and almond meal in a shallow bowls. Transfer the date paste to a bowl and mix with a little bit of water, cinnamon, and the chopped pecans. Mix thoroughly with your hands. Taste to check the amount of cinnamon you want. Form little balls with your hands, then coat in honey and then in almond meal. Serve in a platter or individual plates and enjoy! As for the story, I wanted to feature an Ancient Egyptian Activity kit by Dover Publications. It was a gift for Miss I for her past birthday, and she absolutely loves it. It features 2 coloring books, one with stories about life in Ancient Egypt, and another one about King Tutankhamen. I also has stencils, masks, tattoos, stickers and a poster of King Tut’s burial mask. On books about ancient Egypt for kids there are also The Secret of the Sacred Scarab, by Fiona Ingram (which I loved). and I’m currently reading Cheryl Carpinello’s Sons of the Sphinx. I will be posting that review next week. Hope you had fun with our trip to Egypt with food and stories! If you have any idea or suggestion on books we could read, or recipes we could make, please leave me a comment! Tagged Baking and Cooking, Cooking with Children, Desserts, Vegetarian. I think I commented and told you on a previous post how much I love Egyptian culture, and this is something I’m going to love doing with my kids! Pinning it for future reference. Thanks! Yes, you did! You and my daughter both! Let me know how you like the dessert! And if your children love Egyptian culture as much as mine, I do recommend you get them the activity kit too. Gracias por compartir! Me encantó. Me imagine que te iba a latir . Gracias por visitar! Beer was one of the most common drinks during the Middle Ages . It was consumed daily by all social classes in the northern and eastern parts of Europe where grape cultivation was difficult or impossible. Interesting. Well, it still is a big part of the culture, specially in Germany. The Ancient Egyptian Activity kit looks like a real treasure! It’s so fun to be able to share these experiences with children. Meaningful and engaging entertainment suitable for their age.